Comprising a ground floor retail banking hall with offices overhead. Extending to approximately 438 sq. m (4,715 sq. ft). Let to Governor & Company of the Bank of Ireland. Current rent reserved €100,575 per annum. Roscrea is a town in north Tipperary with a population of some 5,000 people (as of the 2011 Census). The town is situated approximately 48km south west of Portlaoise and approximately 72km north east of Limerick. Transport links include the N62 providing direct access onto the M7 Motorway. The property is situated on the northern side of Castle Street close to the intersection with the Rosemount and Church Street. 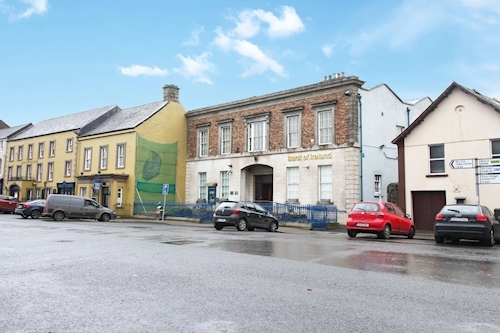 Surrounding properties include Francis Loughnane, Damer Court Hotel and Harrington Bookmakers. The property is arranged over ground and part first floor to provide a retail banking branch. Internally the property provides a ground floor banking hall and offices together with staff canteen, storage and office accommodation at first floor level. The property benefits from a yard to the rear facilitating staff parking. Total floor area extending to approximately 438 sq. m (4,715 sq. ft). The entire property is at present let to the Governor & Company of the Bank of Ireland for a term of 25 years from 2007 at a current rent of €100,575 per annum. The lease provides for upward only rent reviews every fifth year and contains full repairing and insuring covenants. The previous break option in 2022 has been purchased and the tenancy now extends to 2032. We have been informed by the vendor that this property is BER exempt.